"The easiest dessert that everybody loves. I got the idea from my mom and she got it from my grandma. The thing I changed is, I don't use a cake mix. I use items from my pantry, and I add blueberries." Preheat oven to 400 degrees F (200 degrees C). Grease a 9x9-inch glass baking dish. Pour peaches into the prepared dish, and sprinkle the blueberries over the peaches. In a bowl, whisk the flour, sugar, and baking powder until thoroughly combined. With a pastry cutter, cut the butter into the flour mixture to make a crumble, and spread the crumble mixture over the fruit. Bake in the preheated oven until the fruit is bubbling and the topping is golden brown, 45 minutes to 1 hour. Allow to cool; filling will thicken as it cools. Nutmeg and cinnamon flavor fresh peaches wrapped in flaky pastry. I did add 2 tablespoons of cornstarch and 1/2 cup sugar into the fruit, other than that, I followed the recipe. It was pretty tasty! My husband has a sweet tooth so I doubled the recipe. It lasted two days! This is an easy and very tasty dessert to make. 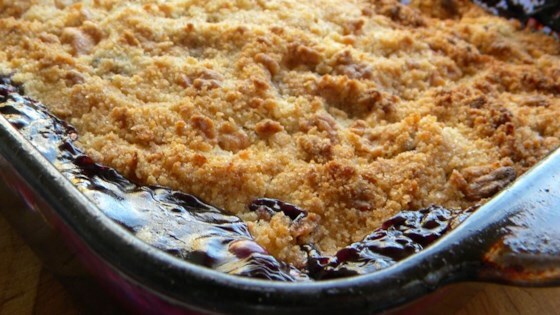 I found that adding a 1/2 cup brown sugar to the crumble makes it a lot tastier. My family and friends go wild when I make it!